Justin and Terry Fischer of Geyserville Tractor Supply with their store dog SweetPea. Geyserville Tractor Supply opened in April 2015, close to one year ago. It is operated by Terry and Justin Fischer, a father son team who have more than 44 years of combined experience. Terry owned a John Deere dealership in Santa Rosa for 30 years before selling the business in 2013. He said Justin has been around tractor dealerships his whole life, working as a service manager at the Santa Rosa dealership for 14 years. According to Terry, experience is what they offer above all else. “It’s always easier if you have someone with a little experience,” he said. With so much of their lives invested in the tractor industry, they are bringing a highly specialized skill set with them to their new business. They chose to open a shop in Geyserville as it is a center for farming. With vineyards on all sides of them, they are conveniently located for customers. 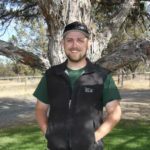 With a plan to eventually have a service shop, Justin joked customers would be able to drive their tractor right to the shop instead of having to load it on a trailer and drive it to a different city. 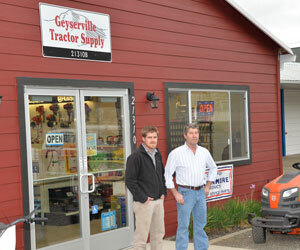 Geyserville has a rich history of tractor stores, with Hanspeter Tractor and Equipment occupying the building leading up to the sixties and then Geyser Tractor Co. operating out of the building for a short time. Lampson Tractor & Equipment also operated out of a building right down the street for years. Terry said some people have mistaken Geyser Tractor Co and Geyserville Tractor Supply, although he didn’t know the building had had a similar name until he bought the property and moved in. The Fischers have already had four to five customers come in reminiscing on how their fathers had also bought their tractors at the exact same location. Terry is proud of the building’s history, and plans to frame old photos of the store and hang them on the walls in the future. The Fischers are selling Deutz-Fahr tractors, a German-Italian brand popular throughout Europe. Justin said they decided to carry the brand after meeting the rep and realizing the tractors had a lot of features other common brands didn’t such as four-wheel brakes. Additionally, they carry all types of tractor parts, Husqvarna Brand chainsaws and parts, vineyard supplies and some general farm supplies such as rain boots. 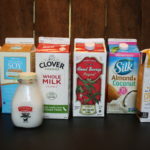 They have worked at figuring out how to sell all their products for cheaper prices and said their prices are competitive. They said they are still growing, albeit slowly. They figure they have at least one new customer every day and some days closer to three new customers, most of which they expect to return. It is evident they are a family run business. Justin’s mother, Shelly, makes homemade cookies for the store on a weekly basis. “If you come in and don’t find anything, you can always leave with a cookie,” said Justin. Justin’s fiancée, Erin, comes in once a week and do their bookkeeping, and their one year old son Alexander is also in the store about once a week. Justin said his son loves coming to the shop. “I hope my son will want to grow up and work here just like I worked for my dad,” he said.